The largest single ski area in the USA with the most high-speed detachable quads on one mountain. Regarded by many as one of the world's top five all round ski resorts. When will it snow in Vail? 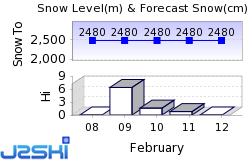 The next notable snow forecast for Vail is 24cm10in, expected on 30 April. The American Ski Resort of Vail has direct access to 193 marked pistes, served by a total of 33 ski lifts. The ski resort itself is at 2,500m8,202ft, so skiing or boarding back to the resort is usually possible. With ski lifts as high as 3,530m11,581ft, skiing and snowboarding is assured throughout the season. One of the world's most famous resorts and for many the top resort in North America, Vail is a surprisingly young resort, conceived in 1962 by a gentleman called Peter Seibert. In being wholly purpose-built rather than claiming some tenuous link to the 'Old West' it differs from many other famous Colorado ski resorts. It's different again from the other Colorado resorts that have been started from scratch in that Mr Seibert did a rather nice job - creating a US resort with an Alpine village feel and an ambience that the majority of North American ski centres sadly lack. He was helped on his way by the first business owners in the area - many of them from Austria and Germany, anxious to recreate a little of what they missed from home. The centre of what is now a town has been pedestrianised, further enhancing the holiday atmosphere. Due to its incredible success the resort has inevitably spread out along the sides of the I 70 valley in both directions, with modern developments linked by an efficient shuttle bus to the central Vail Village. More than 4000 staff are now employed by Vail Resorts alone. The resort has also spawned new resorts such as up-market Beaver Creek and the developments at Arrowhead and Bachelor Gulch, as well as buying up near neighbours in recent years, including Breckenridge and Keystone - creating a very appealing group resort lift ticket in the process. Indeed Vail is marketed very much as a 'Valley'. Apart from the resort's own developments they include revitalised original settlements such as the former rail centre at Minturn, home of quaint art galleries and a winery and the tiny community of Redcliff, an 1890s gold-mining centre in a picturesque canyon over Battle Mountain Pass. Avon, between Vail and Beaver Creek (10 miles/16km apart) has developed from a ranching community into the administrative and commercial heart of Vail Valley. Beaver Creek, still marketed alongside Vail, has very much established itself as a unique resort in its own right whilst the newer-still Arrowhead, closest to the local Eagle County Airport, is centred around a Jack Nicklaus-designed Country Club of the Rockies. Because of Vail's phenomonal success, building in the area shows no sign of slowing, to the alarm of some locals and environmentalists from outside the area who are becoming increasingly vocal in their concerns of 'over development'. In common with other Western North American resorts Vail gets huge powder snow falls each season, in Vail's case averaging 27 feet / 842 cms per annum. Vail has great skiing for all standards and it's all on one mountain so you don't need to take shuttle buses to get about - unless you want to use your lift ticket at another of the Vail Resorts owned ski centres in the area. Vail mountain is the single largest ski area in the US and it has the most high speed quads on a single mountain - useful queue gobblers with the resort being so popular. Electronic signs located at key points on the mountain advise of areas where there is queue build up at peak times so you can avoid them. The lift system is very well designed so it's easy to move about quickly and to organise rendez-vous with party members if you split in to smaller groups to tackle different terrain. The 47% of terrain that is easy or intermediate standard is mostly on wide open trails that are unintimidating and are north facing with, of course, state-of-the-art snow-making to cover any failure on the part of mother nature. The treeline is high - at 11,000 feet (3,353 metres), much higher than the Alps, so the slopes are often cut through pleasant woodland and forest. The key access route on to the mountain outside Vail town itself is the Lionshead Gondola, installed in 1996 with a 14 million dollar investment. Typical of the resort, the cabins, originally designed to hold 15, have had capacity decreased to 12 people each - giving a higher quality uplift experience. Apart from the regular skiing terrain the lift accesses a night-time activity centre - Adventure Ridge. During the daytime beginners will find state-of-the-art ski tuition programs, naturally, and a dedicated beginner skiing area, as well as long easy runs from the top of the mountain as soon as you have a little confidence. Intermediates have the biggest single mountain ski area in North America to enjoy - and one of the world's largest. Intermediate skiers can safely tackle some of the easier runs in the Back Bowls (see below) also. With just over half and the largest chunk overall of Vail's terrain graded advanced - expert, Vail is an essential stop on the tour of skiers who spend their lives checking off the world's top destinations. Vail's status as the ski racing capital of North America has been underlined by it being chosen as the venue for the World Alpine Skiing Championships twice in 11 years - 1989 and '99. The resort has also hosted world cup finals in recent years and is a training base for the US Ski Team. However the main magnet for most good skiers are the legendary Back Bowls (Vail has trade-marked the words 'Back Bowls'). Six miles (nearly 10km) wide these snowy expanses a world-away from Vail resort have dozens of black trails and off-piste routes down in to them, with lifts serving to return skiers and 'boarders to the top of the bowl and back down the front of the mountain to the resort. The expansion in to a further large area of terrain, originally known as the Category 3 expansion but renamed 'Blue Sky Basin' was partially opened in January 2000, the remainder in the 2000 - 2001 season. Four quads serve this newest area, envisaged though it was 40 years before in Vail's original development plan. Few visitors to Vail of more than a few days will miss the opportunity of skiing the resort's other ski centres all on the same lift ticket. Breckenridge and Keystone remain the new aquisitions whilst Beaver Creek and Arrowhead, both 'purpose built' by Vail itself are now only the second 'European-style' lift-linked pair of ski villages in North America (Smugglers and Stowe in Vermont being the other two). This achievement follows the linking of the two ski areas by the Bachelor Gulch Express in 1996. It may be considered 'cheating' by some to build the ski area and the ski resort yourself in order to have something to link the other resort to, but that's really being rather petty - the idea is a nice one! Vail's snowboarding facilities continue to evolve every year. The snowboard terrain park at the Eagles Nest at the top of Vail Mountain, accessed at night by the Lionshead gondola is one of the longest established, its twin half pipes are served by a dedicated surface lift. There are other snowboard parks and features dotted around the mountain and at Vail's other ski centres. In Vail the 'Hot Dog Park' has metal and wood sliders, a jobline and more whilst Beaver Creek's Strickline Snowboard Park is set amongst the trees in natural wooded terrain. Vail unveiled a newly redesigned Golden Peak Park featuring Colorado's only double barrel super pipe. Improvements included the new super pipe and a new mini jib park at the Burton Super Center. The double barrel super pipe consists of two side-by-side, 400 foot half-pipes. The largest of the two features 15-foot walls with 17-foot transitions. To help maintain a consistent riding surface and create the super pipe, Vail purchased a Super Pipe Dragon.. The resort also added a new Dew Drop Inn sponsored by Mountain Dew at the top of the pipe. The Dew Drop Inn is a heated yurt with vending machines, snacks, sodas, parts kits, video games, tool benches, music videos, a new sound system, as well as a 40-foot deck that provides great views of the Golden Peak Park and super pipe. In addition, the multi-level Golden Peak Park offers various levels of challenging tabletops, spines and jumps that will begin just below the super pipe. This design will allow riders to catch air while going from hit to hit all the way down to the bottom. To further its commitment to snowboarders, Vail also grooms all of its pipes and park daily - whether by machine or hand. Pipe and terrain park specialists oversee the maintenance and service of the areas throughout the season. Grooming times will be posted daily at the top of the Dew Drop Inn, so park enthusiasts know when a freshly cut pipe will be available. The Snowboard School offers tuition from beginner level through freestyle and Alpine Classes for the experienced. Snowboard Camps are also organised with specially designed 'Quick Carve sessions' available to advanced skiers who want to move quickly in to snowboarding. More experienced 'boarders will of course enjoy the Back Bowls and many other exciting routes and the Black Forest Race arena offers head-to-head racing for medals. We don't currently have confirmed season dates for Vail. Usual opening is late November, and usual closing is Late April . NOTE:- Lift and Piste openings are always subject to Snow Conditions in Vail. The 33 ski lifts of Vail are able to uplift 51,781 skiers and snowboarders every hour. Vail is in the American Rockies in Eagle, Colorado, United States. The nearest airports to Vail are Vail/Eagle, Aspen and Steamboat Springs. There are six airports within three hours drive. Vail/Eagle is just one hours drive away, in good driving conditions, so you can be on the piste quickly. The Webcams in Vail are not always up-to-date. Please check the date on the image to ensure you are seeing current snow conditions. Après ski normally gets rolling around 4ish and runs on through in to the small hours. The choice of night spots is not bettered in any other ski resort. A good choice to start, if you'd prefer coffee to alcohol, is the Daily Grind, a popular coffee house known for its Java. Favourite long-standing spots are Pepi's Bar and Sheika's nightclub at the intersection of Bridge Street and Gore Creek Drive. Both are located in the Gasthof Gramshammer owned by Vail pioneers Pepi and Sheika Gramshammer. Vail's microbrewery, the Hubcap, is a favourite with the locals as well as visitors. There are dozens more in Vail itself and throughout the valley. Apart from clubs and bars there's a lot more choice in Vail - the Eagle's Nest Activity Centre at the top of the gondola offers sliding under the lights in to the night, or you can take a sleigh ride. Want to Know when it Snows in Vail? Click above to get Snow Reports by e-Mail for Vail. By doing so, you agree to Our Rules. Other popular Ski Areas near Vail. Ski Hire Shops in Vail. For current snow conditions, see our Vail Snow Report. Want to ask about skiing and snowboarding in Vail? Or contact Vail Tourist Office. Note :- The information on J2Ski concerning Vail, where not clearly factual, is opinion only and is neither definitive or exhaustive. Warning :- Snow Sports are Dangerous! Skiing, snowboarding and all winter sports involve risk of serious injury or death. You MUST confirm all information, especially snow and weather conditions, in Vail before you ski or board. You participate at your own risk.